First I had to figure out what to buy, and how much. 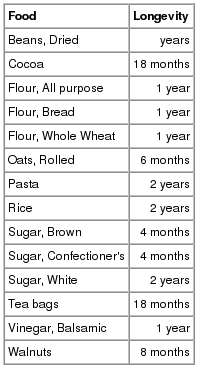 I've summarized how long various foods can be expected to last in the table to the left. I decided to start out with a "small" amount of a few items for our first experiment, skipping the sugar and pasta which seem to cost the same in the grocery store as in bulk, any items which last less than six months, and items we don't use enough of to merit a bulk purchase.